Photolithography comes from the Latin words for: Light, Stone, and Write. In other words, photolithography in Latin means printing with light. This process was invented in 1855 by Alphonse Poitevin. 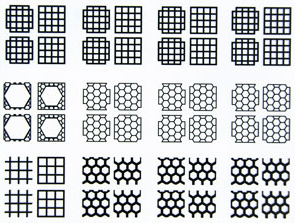 To create the desired pattern on the Mylar surface, photo resist is put on top of the Mylar surface. The intense UV light is put over the Mylar with photo resist, which causes a chemical reaction and creates the desired pattern or features. As the resist is developed the unnecessary photo resist is washed away. This process can be repeated as many times as necessary to create the desired effect and features.